Choose NTSC D1 from the Preset pop-up menu. NTSC D1 is the resolution for standard-definition television in the United States and some other countries. This preset automatically sets the width, height, pixel aspect ratio, and frame rate for the composition to NTSC standards. In the Duration field, type 300 to specify 3 seconds. 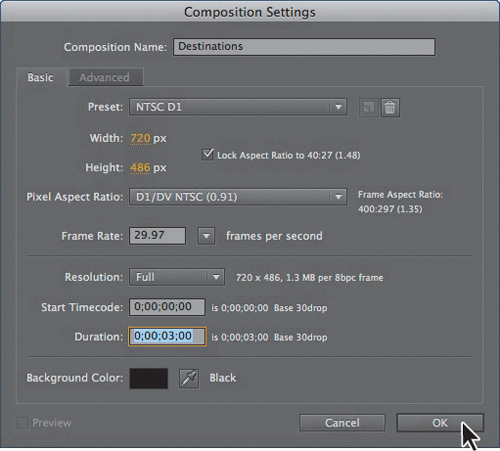 After Effects displays an empty composition named Destinations in the Composition panel and in the Timeline panel. Now, you’ll add the background. Drag the parthenon.jpg footage item from the Project panel to the Timeline panel to add it to the Destinations composition. 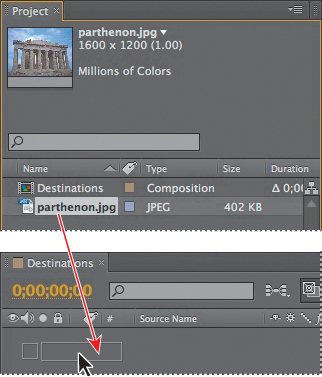 With the parthenon layer selected in the Timeline panel, choose Layer > Transform > Fit To Comp to scale the background image to the dimensions of the composition. The keyboard shortcut for fitting a layer to a composition is Ctrl+Alt+F (Windows) or Command+Option+F (Mac OS). Your background is now in place. The foreground object you’ll use is a layered vector graphic that was created in Illustrator. Select Composition from the Import As menu, and then click Open. 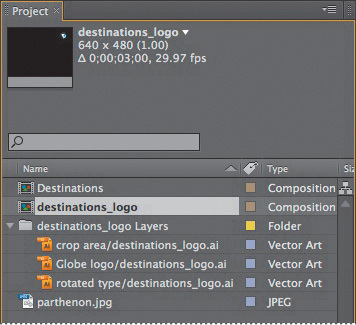 The Illustrator file is added to the Project panel as a composition named destinations_logo. A folder named destinations_logo Layers also appears. This folder contains the three individual layers of the Illustrator file. Click the triangle to open the folder and see its contents if you’d like. Drag the destinations_logo composition file from the Project panel into the Timeline panel above the parthenon layer. You should now see both the background image and the logo in the Composition panel and in the Timeline panel.